The Southern Unit is a team of skilled volunteers that operate out of the Wickenburg area and covers the southern half of Yavapai County. Under the direction of the Yavapai County Sheriff's Office, this unique team is comprised of multiple areas of expertise--- a quad section, a 4x4 section, and a ground tracking section, as well as a fully equipped communications operation. As diverse as the geography it covers, this unit can operate as both a stand-alone search unit and as an augmentation to other YCSRT units. SYCSRT volunteers must have a valid Arizona driver's license and be able to pass a background check. Expenses are tax deductible, with some costs reimbursed by the county. Volunteers provide their own equipment, such as, radios, GPS devices, vehicles. During the initial probationary period much of this equipment may be available by loan from the unit. 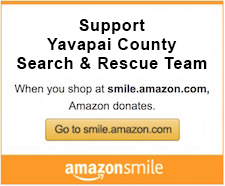 Volunteers need not live in Yavapai County, only nearby. Many volunteers for the Southern Unit come from the Wickenburg community as well as Congress, Yarnell, and Peeples Valley. Part-time residents are also encouraged to apply. Volunteers should be capable of outdoor activity with a commitment to attend monthly meetings and one training day a month where all the skills you need to know will be developed.